Departing the Managua International Airport (MGA), our 12-passenger, single prop aircraft flew northeast. As we approached the Rio Coco, Central America’s longest river, which separates Nicaragua from Honduras, the pilot banked slightly, taking a more easterly course. For the next 45 minutes we followed the river. Only a few villages and even fewer roads were visible from our low, cloudless altitude. 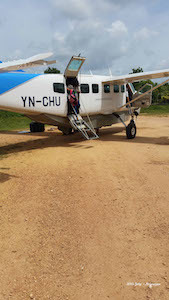 As the pilot announced our descent, it became apparent we were landing on a dirt strip outside the largest village we’d seen. The village is isolated, largely undeveloped, and lacks many modern conveniences. Poverty is abundant. Running water and electricity are non-existent in many homes. GETTING HERE: The regional airline, La Costena, offers flights from Managua on Tuesdays, Thursdays, and Saturdays, with return trips on the same days; flight time is about 90 minutes. Driving is also a possibility, and while it may be cheaper, a one-way ride takes more than 24 hours. WHERE TO STAY: Hotelito El Piloto (505-792-9045). Although there were a couple signs advertising B&Bs and rooms, no contact or actual location information was provided. WHAT TO DO: With the village being frequented by more missionaries than tourists, normal tourist activities are not available. However, exploring neighboring villages by boat and car can be arranged. With the assistance of the Hotelito El Piloto owner, our upriver excursion was scheduled for the morning, and a downriver trip in the afternoon. Each trip was scheduled for four hours, with a break for lunch at the hotel. RIVER BOAT EXCURSION: There are two types of boats available, the U.S. standard v- or flat-bottom, and a log dugout known as a ponga. 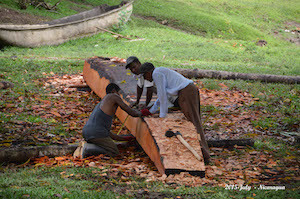 Our boat was an 18-foot v-bottom, but most locals use the more common ponga; these are handmade by locals, using local logs. 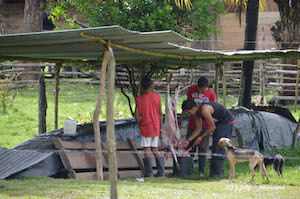 Keeping within the confines of time, the first stop was about 25 miles upriver at San Jeronimo. While this village is accessible by road, only a couple trucks were seen; residents prefer using the river. From here we started our return ride, stopping next at Bull Sirpe, then Wis Wis. Neither of these villages is accessible by road. TAXI ROAD TRIP: As with the river trip, this too was scheduled for four hours. However, due to the afternoon rains, the trip was reduced to three hours. While these villages are accessible by road, the roads are not paved. They were wide enough for two vehicles, but the lack of maintenance kept speeds to less than 30 miles per hour. Our first stop was about 15 minutes from Waspam in the village of Ulwas. From there we continued to Saupuka, then Bilwaskarma. Turnoffs from the main road leading to the villages frequently look more like trails than roads. While the villages upriver and downriver are much like Waspam, poor and undeveloped, the residents were welcoming and friendly. With the primary language being native Miskito, little English was spoken, so verbal communication was limited. 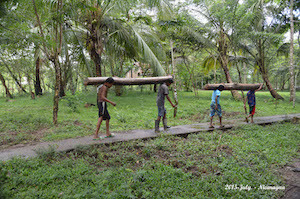 Young and old worked building boats, gathering logs for homes, butchering animals, and doing whatever was needed. In between their chores, children played like any other child around the world. Baseball, tag, and running were common themes. Our stay lasted two days and we did not experience any safety or security challenges; people were welcoming.